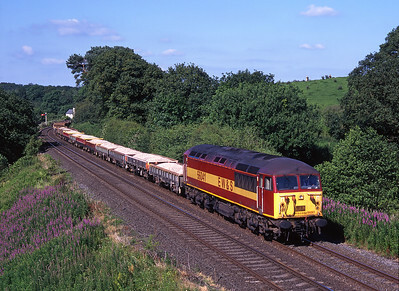 56074 "Kellingley Colliery" passes Elmsfield with a northbound enterprise freight on 28/7/99. 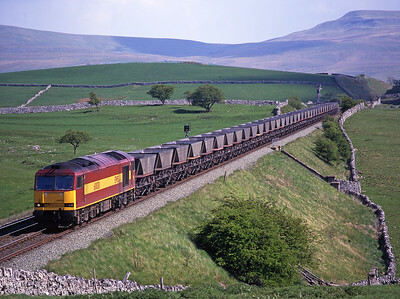 86424 passes Shap Beck with Parcel Force trailers on 27/7/99. 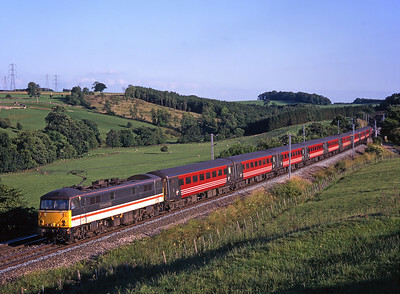 37612 + 20302 pass Scar Top with a Crewe-Carlisle charter on 24/7/99. 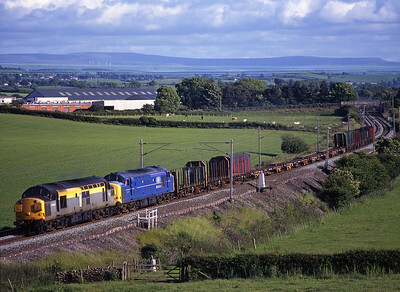 20312 + 20313 cross Leven viaduct with early morning flasks on 24/7/99. 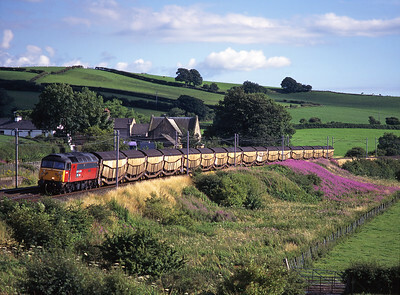 37799 "Sir Dyfed/County of Dyfed" passes Elmsfield with coal empties on 22/7/99. 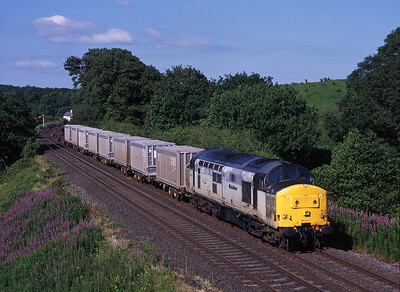 47773 "Reservist" passes Burton & Holme station with a car train on 22/7/99. 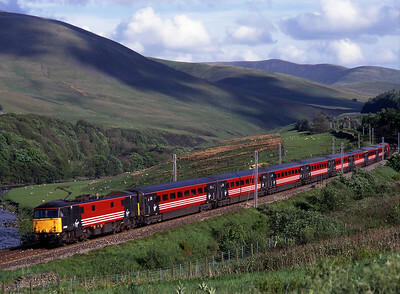 87026 "Sir Richard Arkwright" passes Great Strickland with a Euston-Carlisle train on 12/7/99. 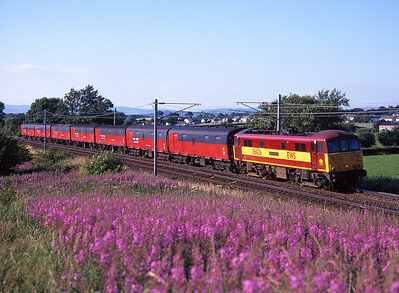 86426 "Pride of the Nation" passes the willow herb at Burton with 1V04 the Bristol mail train on 12/7/99. 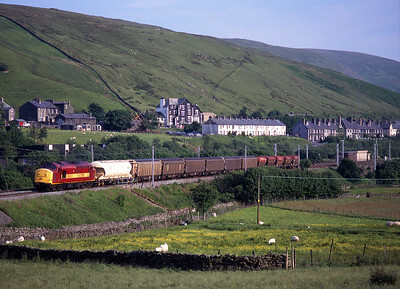 3 hours after photographing it at Milton, 56041 passes Garsdale with an engineers train on 11/7/99. 56041 passes Milton with an engineers train on 11/7/99. 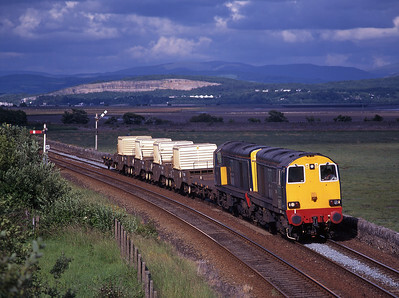 37800 passes Milton with Hoya containers on Sunday 11/7/99. 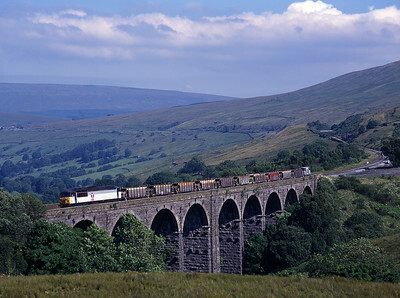 56079 crosses Dent Head viaduct with another engineers train on Sunday 11/7/99. 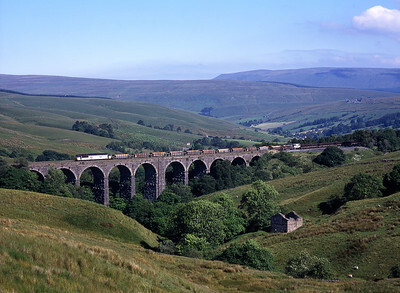 56040 crosses Dent Head viaduct with an engineers train on Sunday 11/7/99. 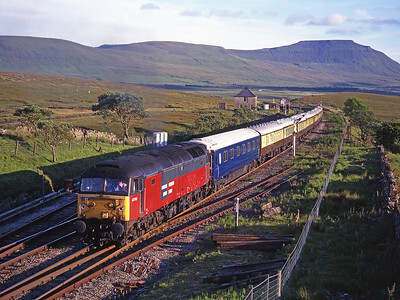 47763 passes Blea Moor with a Leeds-Kirkby Stephen VSOE on 29/6/99; 56025 was on the rear. 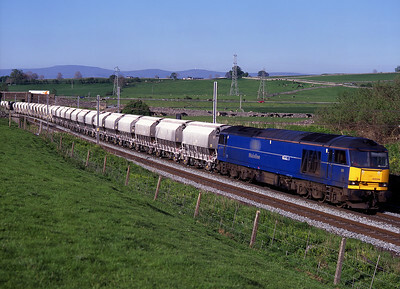 20314 + 20315 approach Grange with the Heysham flasks on 28/6/99. 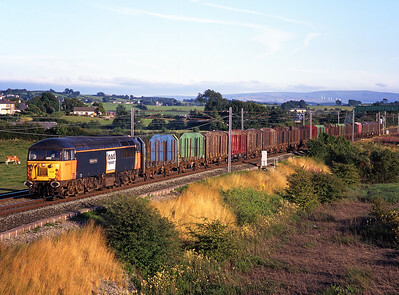 60023 hauls a Saturday morning coal train at Mossy Bottom, as a 156 heads north, 26/6/99. 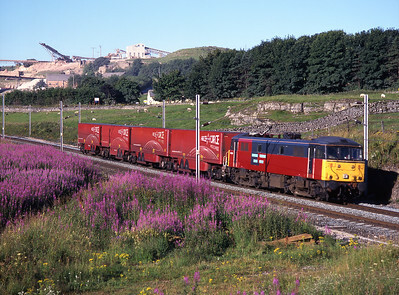 37895 passes Tebay with 6S72 Enterprise freight on 24/6/99. 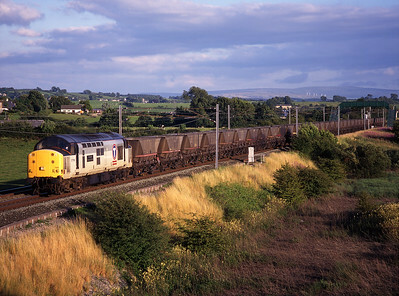 37058 + 37371 haul the evening Enterprise north of Milnthorpe on 21/6/99. 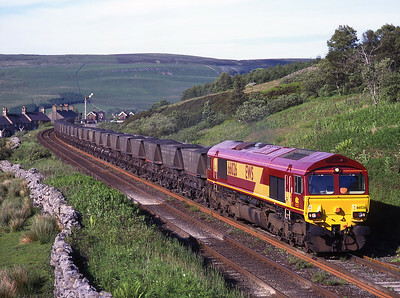 Shiny new 66026 passes Garsdale with a coal train on 16/6/99. 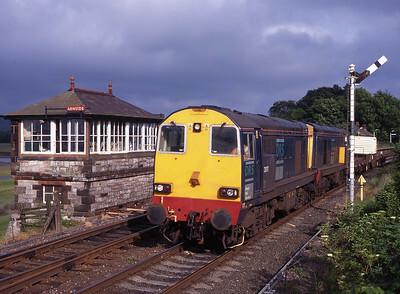 20307 + 20312 pass Arnside signal box with a flask from Heysham on 15/6/99. 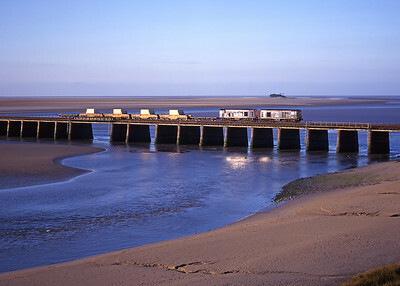 Carrying "The Waverley" headboard 20314 leads 37607, 20301 & 20303 and 6 flasks north of Barrow on 22/5/99. 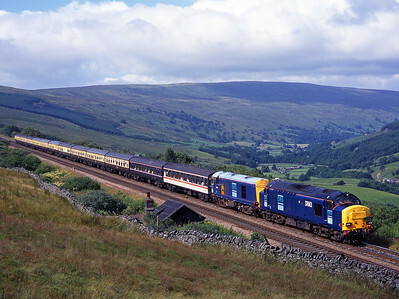 20307 + 20310 pass Elmsfield with flasks from Valley, 21/5/99. 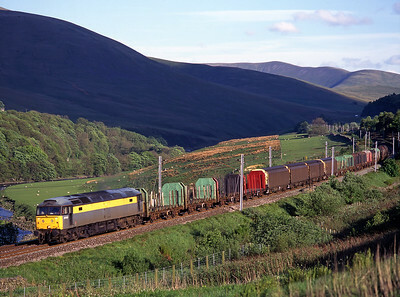 47331 was unusual power for this Arpley-Mossend Enterprise freight, seen in the Lune Gorge on 21/5/99. 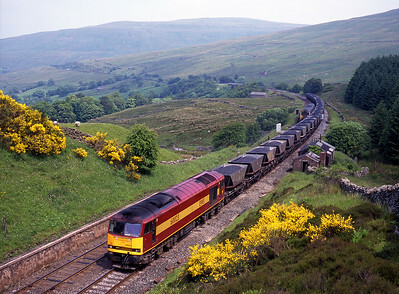 87008 hauls a Euston-Glasgow service through the Lune Gorge on 21/5/99. 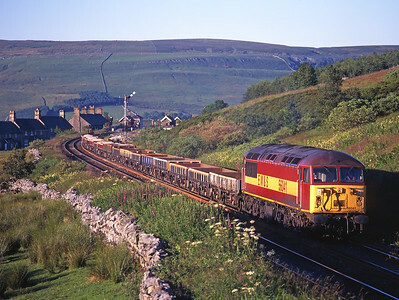 De-named 60044 passes Shap Beck with limestone empties for Hardendale on 18/5/99. 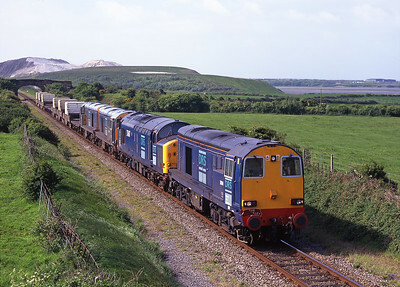 37797 + 37198 haul the china clay tanks past Well Heads on 10/5/99. 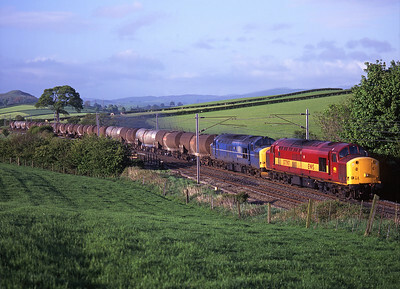 60030 heads north at Waitby with coal empties on 3/5/99. 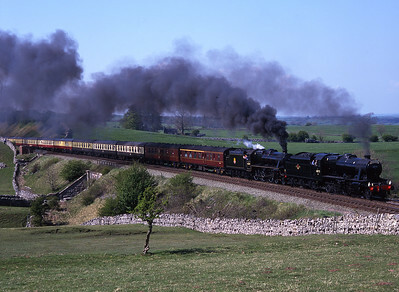 48773 & 45407 pass Waitby with a Cumbrian Mountain Express on Mayday 3/5/99.